Mt. Gox is the most widely known bitcoin exchange, but it has suffered a chequered history. We take a look at all its features so you can decide whether or not it’s the exchange for you. Mt. Gox is an unlikely name for an exchange – it’s actually an acronym for “Magic The Gathering Online eXchange”. Still though, it’s impossible to be involved with bitcoin and not to have heard of the exchange, which launched in 2010. Mt. Gox is certainly well established. It was only recently that competitor exchange Bitstamp overtook Mt. Gox in trading volume for the first time. However, an appraisal of Mt. Gox cannot be made without referencing the problems its users have faced (and are still facing) when it comes to withdrawing funds. There has already been an instance where the exchange suspended USD withdrawals, but it resumed them two weeks later. This naturally led to a loss in confidence by users and a simple search of the bitcoin forums will show that many people still have long awaited fiat fund withdrawal orders lodged with the company. Reports from some users state that they have been told they should pay a 5% fee on transfers if they want to speed up their withdrawals. Mt. Gox has partnered with a content delivery network in order to improve the site’s performance. However, this hasn’t changed the withdrawal time issue, seeing as that depends on the banks Mt. Gox works with. Confidence was further knocked when the US government seized $2.9m from the exchange. All of which has resulted in Mt. Gox clearly losing some of its market share. On top of this, Mt. Gox is also in a bitter legal battle with CoinLab, a bitcoin incubator. Mt. Gox’s website has a fairly professional, clean design. However, it isn’t always obvious where to find certain options. 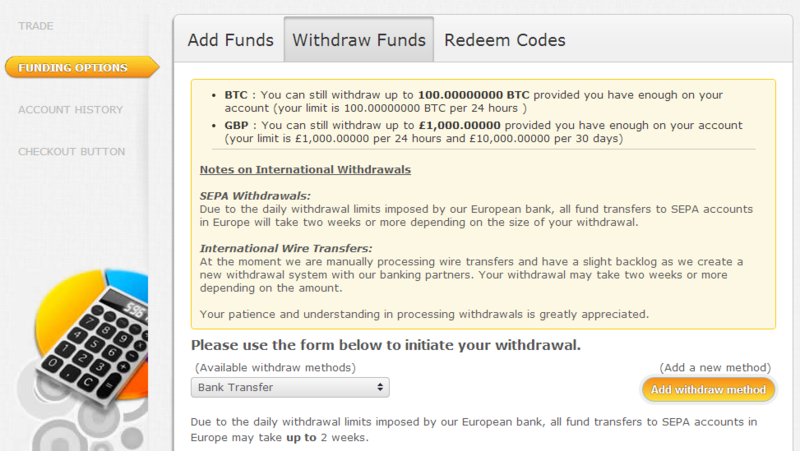 For example, the withdrawal options are shown in the ‘Funding’ page. If you want to view charts of market performance on Mt. Gox, you’d be forgiven for missing them on first examination. However, if you click on the market values on the top row of the website, it will extend a chart area. This shows volume and candlestick charts for daily, weekly, monthly or custom ranges of time. There’s also a merchant section of the site where you can set up a payment button for your website if you want to accept bitcoin payments. Mt. Gox used to support alternative payment systems Dwolla and OKPay, but these options have been disabled on Mt. Gox for a long time (it seems that Dwolla has since abandoned the bitcoin world anyway). This leaves international wire transfers (including SEPA) as the only option to add or remove fiat funds to/from a Mt. 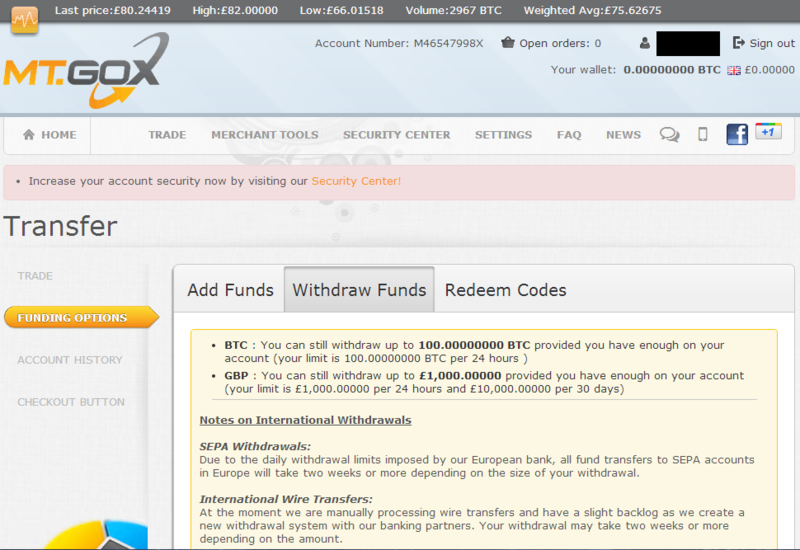 Gox account. In many countries (eg the UK), international wire transfer is the only option for getting funds into an exchange and, unfortunately, these transfers are slow and expensive. To make matters worse, Mt. Gox advises that SEPA transfers to its bank can take up to two weeks, which is a definite strike against the exchange. Once you have funds in your account, placing buy and sell orders is quite easy. As with BTC-e, if you accept the price per bitcoin already added to the order form, you’ll probably have your order executed right away. You are free, however, to change the price to meet your needs in exchange for waiting for matching offers to come up – which Mt. Gox will automatically complete for you. The price of bitcoin on Mt. Gox remains higher than on other exchanges such as BTC-e and Bitstamp, because customers cannot withdraw their dollars easily to their accounts. As reported by Forbes, a price on Mt. Gox “measures the price of a bitcoin plus the desperation of Mt. Gox’s customers”. Currently, the CoinDesk Bitcoin Price Index does not include the Mt. Gox price for this very reason. This means two things: buying bitcoin on Mt. Gox is relatively expensive, and selling bitcoin purchased elsewhere could be profitable (arbitrage). The problem with buying low elsewhere and selling high on Mt. Gox is that you’ll be hard pressed to actually get money out of the exchange again. If the problems are resolved, it is likely the prices will normalise to within several percent, which should be acceptable, given the fee differences. The best you could hope to do is to buy bitcoin elsewhere, transfer to Mt. Gox and enter buy and sell orders to make incremental profits before withdrawing your bitcoin elsewhere to convert into fiat funds. This is far from an ideal situation. As with other exchanges, Mt. Gox takes a small cut of bitcoin purchases. For small trades (eg below 100 BTC), this fee is 0.6%, which is somewhat higher than you’ll find on BTC-e (0.2%). 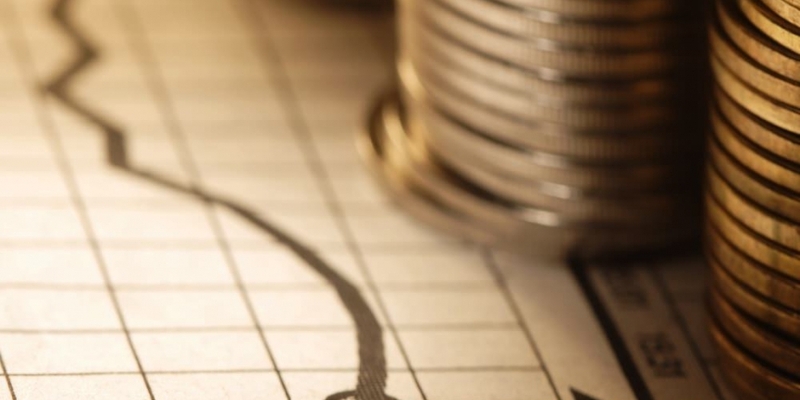 The 0.6% fees reduce on a sliding scale as the user’s trade volume increases. However, the volume increments are so wide that they only really apply to big-money professional traders, not the average user who is buying a few bitcoins here and there. You can see the full fee schedule here. The first thing anyone will have to do to start using Mt. Gox is submit the usual set of document scans, such as photo ID and utility bills as proof of residence. This process took about as long as it did with other bitcoin exchanges I’ve used. In my experience, though, trying to get an answer from Mt. Gox customer support to handle a problem takes longer than other exchanges I’ve tried. Lastly, Mt. Gox has an official Android app. However, this app is not able to connect to user accounts, and has been in this state for at least four months. Is Mt. Gox your exchange of choice? Have you had issues with withdrawing funds? Let us know in the comments.